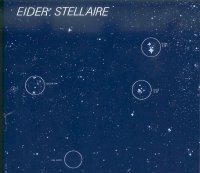 Eider Stellaire’s first album was recorded & issued in 1981 as a micro private press of 300 lps. The band was led by drummer Michel Le Bars who, in the mid 80s, will join Christian Vander’s post-Magma band Offering. Eider Stellaire opened frequently the concerts for Magma in 1982, as both bands shared the same musical vision: the european 20th century classical roots (Bartok, Stravinsky, Orff) mixed with pure rock energy, the huge importance of the rythm section & the wordless female vocals. Of the 3 lps issued during the lifetime of the band their first is unique and sees the band play with fire strong compositions. Weidorje and this recording are the 2 masterpieces of the Zeuhl genre. A reissue of this legendary lp (rare as hell on vinyl & nowdays selling for a fortune with its original dark blue constellation cover – which we used for the CD reissue) was long awaited by fans but never saw the light until now because of Michel Le Bars’ constant refusal of any reissue. A few months ago he suddenly changed his mind and Soleil Zeuhl is delighted by the privilege of producing the first reissue ever of this gem – a must-have! The CD (digipack) features a bonus track, a superb 10 minutes long alternate version of “Nihil”.